A rendering by architecture firm Morris Switzer of Eastern Maine Medical Center's $250 million expansion and modernization project. The Eastern Maine Medical Center complex in Bangor. BANGOR, Maine — Eastern Maine Medical Center will build a seven-story tower at its State Street campus as part of a $250 million project described as the largest ever undertaken by the hospital’s parent organization. 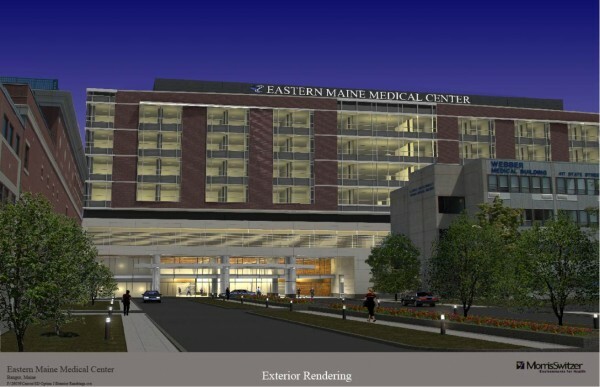 The board of directors for Eastern Maine Healthcare Systems, of which EMMC is a member, gave final approval to the project Tuesday, more than five years after plans were first presented. In addition to demolishing the hospital’s Stetson building to make way for the tower, plans call for adding more than a dozen operating suites, boosting the number of private patient rooms, updating cardiac and obstetrics services, and relocating the neonatal intensive care unit. The project is imperative for EMMC, which serves more than 40 percent of the state’s population as the only provider of many specialty medical services, including trauma and advanced critical care, in the region, said Deborah Carey Johnson, the hospital’s president and CEO. “Without this project, specialty care in northern and eastern Maine would really be at risk,” she said. The tower project is one of the most ambitious tackled by a Maine hospital in recent years. It’s smaller than MaineGeneral’s pursuit of a $300-plus million hospital in Augusta, but dwarfs Maine Medical Center’s plan for a $40 million expansion and update of several operating rooms. Also in Portland, Mercy Hospital has been shifting its services to a new campus on the Fore River, a multi-year project pegged at $162 million. The most recent significant construction project at EMMC’s State Street campus was a $16 million, five-story parking garage that opened in 2009. EMMC has focused more on outpatient services in recent years, with the construction of its health care mall on Union Street and, in 2000, of the Kagan building at its main campus, Johnson said. “Where we’ve fallen behind a bit is on our inpatient campus,” she said. The outpatient additions were significant, but the tower project approved this week represents a milestone for EMHS, she said. EMHS is one of the state’s largest healthcare systems, counting not only seven hospitals among its members but also numerous home health organizations and several physician groups and nursing homes. Space constraints now limit the hospital to using about 350 inpatient beds, well short of the 411 beds it’s licensed for, Johnson said. When 90 percent or more of those available beds are full, patients sometimes face long waits for admission to the emergency room or to referring hospitals in the area. With the new tower, EMMC will be able to operate at full capacity, she said. That means the hospital will need to hire about 50 more physicians, both primary care and specialists, as well as more nurses and support staff, Johnson said. With the board’s unanimous vote Tuesday, EMMC is ready to secure financing for the tower project. The hospital in 2008 won the needed state approval from the Department of Health and Human Services’ certificate of need unit, which evaluates whether proposed health care projects meet patient demand for medical services. 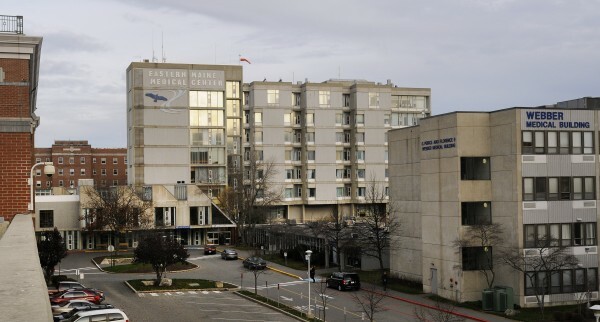 The hospital requested a one-year extension in September 2009 and has since taken preparatory steps, including electrical and utility work on site. The hospital hopes to have financing lined up by the end of the year. The Stetson building is scheduled for demolition next spring, followed by the first phase of construction, a roughly two-year process to build the shell of the tower. The full project, expected to cost about $247 million, is scheduled to be completed in 2017, Johnson said. DHHS’ approval stipulates that EMMC can rely on debt to finance no more than 80 percent of the project’s total capital costs. EMMC plans to fundraise $20 million to $30 million, and collect the rest of the money through existing and anticipated surplus dollars and other financing. Some of the proceeds from last week’s $17 million sale of the hospital’s dialysis clinics to national chain DaVita Inc. will also help to fund the project, Johnson said. Philip Caper, a Brooklin physician who serves as one of roughly 200 EMHS “corporators” on a volunteer board, said he’s concerned that the expensive project could drive up hospital debt and, subsequently, health care costs for patients. The new construction appears to be weighted toward lucrative, high-tech services such as imaging and surgery, he said. “How does this comport with EMHS’ stated goal of increased emphasis on primary care?” he wrote in an email. Caper is a columnist for the Bangor Daily News and a founding board member of Maine AllCare, a nonprofit group committed to universal, affordable health care. The new tower will house advanced health care services that have outgrown the nearly 40-year-old Grant building on the EMMC campus, Johnson said. The hospital will replace 11 outdated operating suites with 14 new suites that can accommodate robotic surgery, computer-assisted equipment, and other modern medical techniques, she said. Several outpatient operating rooms will be updated so they can be used interchangeably for inpatient procedures, as well, she said. “That will allow a lot more flexibility for the functioning of the operating rooms,” Johnson said. Many cardiac services will be relocated to the new tower. The neonatal intensive care unit, which now shares spaces with obstetrics in the Grant building, will move to the tower’s seventh floor. That will allow obstetrics to expand in its current location and become an updated labor and delivery center with all private rooms for expectant mothers, Johnson said. In all, EMMC will add 73 private rooms for patients, she said. Services housed in the single-story Stetson building near the hospital’s entrance, including the hearing center and pharmacy, will be relocated. EMMC is shoring up an access road behind the hospital to facilitate construction. “There will be a need to reroute traffic, so we’ll be working closely with our staff and the city to accomplish that,” Johnson said. DHHS required EMMC to commit to using green building methods in constructing the tower project. The hospital’s commitment to modernizing its facilities will not only benefit patients, but will also help EMMC to attract and retain top-notch physicians who need space to do their work, Johnson said. “We don’t have adequate facilities to accomplish the services for patients that only we provide” in the region, she said.